“To provide you with an introduction of the different investor ecosystems in Europe, we want to start with a new blog series. The first one, you are reading it right now, will cover the Hungarian startup and investor scene. Antal Karolyi and Lenard Horgos from HunBAN answered our most important questions. The Hungarian Business Angel Network (HunBAN) is our sister organisation and is building up the local angel ecosystem in Hungary by pulling together the early movers of the community. What are advantages & disadvantages of the national ecosystem? The biggest advantage in Hungary is certainly the very active ecosystem with more than 15.000 stakeholders (if we take the relevant local Facebook group as a measure). This leads to a lively event scene with a rich offer on meetups, workshops and conferences. What is more, there are quite a few local success stories, that are inspiring young talent. The relative young infrastructure in Hungary can impress with an increasing number of incubators, accelerators and other service providers. Also, there is abundant investment capital and EU programs available, attracting most of all strong tech teams and digital natives. Even if the relatively young ecosystem could be seen as a advantage, the downside is that it has many players with little experience. This is especially true for the fields of sales and marketing, where Hungarian founding teams tend to be not so strong. Also, there is still room for improvement in terms of entrepreneurial acumen. Which cities are the startup hubs? Or is it concentrated in the capital? Budapest dominates the ecosystem in all departments but there are small active hubs in several cities outside the capital, like in Debrecen or Szeged. Which industries are a big deal in your country? Hungary is especially strong in IT security, encryption & big data. These are a few examples for niches covering quite a few successful local ventures. Members of the ecosystem also succeed in biotech and medtech. For all industries counts, that B2B successes far outweigh B2C results. Are there success stories we should know of (unicorns, exits, big international investment rounds)? 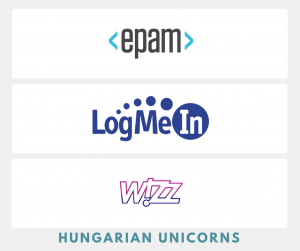 Hungary can impress with three unicorns: epam, Wizzair and LogMeIn. As substantial exits, Hungary has seen Ustream, NNG, IND Group, Evopro, Distinction, Scitec Nutrition, Netpincer, Gravity R&D, Cryo-Innovation and Indextools. Promising scale-ups are Prezi, Tresorit, Balabit, Biotech USA, Starschema, Commsignia, Optoforce, Adasworks and Enbrite.ly (winner at Slush). What does the investment landscape look like? How many angels, VCs, Corporate Venture Funds are there? The business Angel community in Hungary is a bit smaller than in Austria. 90 Angels are affiliated with HunBAN, about 30 of them are really active. It is estimated, that there are around 200 active angels in the country at the moment. When looking at the field of Accelerators, there are around 10-12 active ones, often financed with EU money. VCs are mostly local funds and they are currently state-owned. DayOne Capital is a notable exception. Another €50 million fund supported by EIF(European Investment Fund) is expected to launch in autumn. The market is split between few corporate Venture Funds (some have recently launched pre-seed facilities), some family office – like Andgo Partners and OXO Labs, as well as international VCs like 3TS & iEurope. There are currently roughly 400-500 million Euro available on the market to be invested. Which events/organisations/places should investors (& startups) should visit/get in touch with as a first point of contact? The most important organisations are HunBAN and the Hungarian Venture Capital Association. Where to go first when arriving in Budapest? There are numerous co-working places all over the inner city. Mosaik, Kaptár, Loffice and the ImpactHUB are a few examples. The Hungarian community is incredibly lively when it comes to events. There are literally hundreds of regular meetups specializing on specific topics, events organized by HunBAN, HVCA or the Brain Bar Budapest. How easy/difficult is setting up a company? fairly straightforward. A KFT (Ltd.) can be created in 1 day. Speaking Hungarian helps. What about employee stock option plans – is this a thing in your country/easy to implement? workable, but there are tax issues. Are there public grants for startups? Not really focusing on startups, but some grant calls where newly established companies can apply. Are there tax incentives for angel investors? Regarding this, new legislation is expected to come out this autumn. Is the government supporting startups & investments? There is an increasing attention on the area. Apart from the state fund it is still early steps.